After living for almost eight years with what she called her ‘adventure with cancer’, Anne left her crumbling body at her home in Kleinmond on a cold winter morning in June. She is survived by a close circle of bereft loved ones, a wider circle of friends and writers, and several creative writing initiatives inspired by what was possibly her most valued work in the outside world. After matriculating at Parktown High School for Girls and completing one year at Wits University, Anne dropped out, spent a short while in London and then returned to Johannesburg to explore life’s alternatives. One of her first jobs was working for Fanny Kleneman, owner of the radically intellectual left-wing Vanguard Booksellers, where Anne was exposed to many anti-apartheid and communist activists and texts. From here on she grew and moved steadily out beyond the margins of her conventional, white-privileged background. Socially, a mix of friends (and a few lovers) included writers, musicians, actors and visual artists, all of whom helped Anne in some way to recognise and claim her creativity as well as her lesbian identity and to stimulate the beginnings of what was to become her authentic and quite radical feminist perspective on life. Many of Anne’s other jobs through the years – most notably those at the Johannesburg Reference Library, Salesians Institute Youth Project, Community Arts Project, UCT’s Institute of Criminology and Drama Department and the Black Sash - nourished the story-teller in her and contributed richly to her novel Foolish Delusions; her children’s book The Time of the Stilted People; the novel Classification Pending, written collaboratively with her dear and oldest friend Shirley Pendlebury (under the pseudonym Annie Irons); various short stories and poems published in Circle of Eight, Quarry, Dinaane and Stanzas; her own poetry collections and some rather more subversive unpublished work shared with select friends. Although a gifted and insightful writer herself, Anne ultimately chose to commit her creative energy to serving the writing of others. Her creative writing workshops, the work for which Anne is possibly best remembered by some, were a magical intervention in hundreds of lives - and at the same time, a manifestation of the feminist artist she was. Of all the silenced voices in the world, Anne felt the absence of women’s voices most acutely and so she worked almost exclusively with women. She recognised that women needed safe spaces in which to connect with themselves and potentially even find new selves that might want expression. Anne explored and enriched her creative inspiration and intention with a wide range of feminist and Buddhist readings and academically, through an Honours Degree in Psychology (UNISA) and a Masters in Philosophy (UCT). Although most of the acclaimed workshops were with relatively well-resourced urban women, Anne’s work also made possible the telling and publication of, for example: the life stories of four rural women – each a powerful unrecognised anti-apartheid presence in the racially segregated, forced removal community of Zwelethemba; the stories of groups of women working for their survival and liberation through the Southern Cape Land Committee and the Women on Farms project; and women incarcerated at Pollsmoor. Anne based each of her workshops on meticulous thematic and practical planning. This mindful preparation allowed her the freedom to then unleash a unique and intuitive energy, with remarkable effect in each encounter. Creating a safe, non-judgemental, playful yet philosophically meaningful space, Anne enabled participants to find the courage, not only to write freely but, to listen attentively and appreciatively to the voices of others – and to their own. Many important books might not have come to the published page without Anne’s interventions, in creative workshops and through the individual ‘opportunities to think’ that she offered to workshop participants on request. Another significant aspect of Anne’s workshop presence was the spirit of solidarity that she created, and for which she is celebrated now and will be remembered, hopefully forever by those whose lives she touched. In the last few years of her life Anne once again turned to her own writing, exploring herself, her responses to cancer and the world around her through poetry, a few collections of which were privately published. She again found great pleasure in writing collaboratively with Shirley Pendlebury, this time creating seasonal Renga. Working with Erica Coetzee, she was also able to capture in words many of aspects of her creative writing workshops through the workbook To The Islands. Anne’s quirky sense of humour, her fine intellect, her kindness, her gentle ferocity, her compassion and the true beauty that emanated from her, will be profoundly missed by all who had the privilege of knowing her. As her brother David put it, we always felt that in her eyes we mattered. May her beloved and magnificent soul be well. To the Islands, published by Tiber Tree Press in September 2014, is available from bookshops at R240 and also directly from the authors. Enquire here. To the Islands is a practical guide for writers – beginners and seasoned explorers alike. Discover five imaginary islands that lie waiting for you in the sea of creativity, each with an itinerary specially devised to lead you on writing adventures. Sail to the Island of Wu-Wei, where writing is effortless. Follow your creative intuition around the Island of Wuzhi and write spontaneously on the Island of Ziran. Visit the Island of Xin to write from the body and explore creative tension on the Island of Yin-Yang. There are many approaches to 'learning' creative writing. The approach that underpins this workbook is inspired by practice. It is founded on the idea that what writers need most is to write. Writers find their feet by writing. They tune their voices by writing. To write frequently and with abandon allows you to explore the palettes and scenery of your creative universe. It is through writing that you discover your own islands. Using poetry and prose, the 25 excursions in this workbook will encourage you to experiment and cultivate a writing habit, even if you only have half an hour a day to spare. 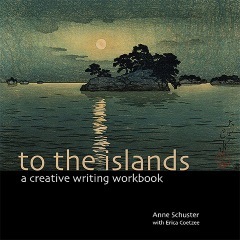 Based on a course designed by acclaimed writing facilitator Anne Schuster, To The Islands is an invaluable sourcebook for individuals, for writing groups and for facilitators of creative learning processes. For thousands of South Africans (including hundreds of female prisoners, farm workers and refugees), Schuster has facilitated the uneven and often threatening space between wishing to write and having written. And while Schuster’s name might not be generally known, many accomplished South African authors have passed through her hands at some point, including Margie Orford (now known in several countries for her South African crime novels), Máire Fisher (who recently released Birdseye to general acclaim); Shaida Ali (winner of the prestigious University of Johannesburg debut prize for her first book Not A Fairytale), and Tracey Farren (whose award-winning book Whiplash is being turned into a movie). Get that writing dream going! Do you harbour a secret dream of writing? Are you already writing, but feeling stuck? Do you simply want to explore your creativity and self-expression? Whatever your response, your experience will surely be enriched by To the Islands, a Creative Writing Workbook. Anne Schuster, the masterly mind behind this beautifully designed guide, is a highly regarded novelist and a renowned and respected facilitator, who has coached scores of authors, encouraging their expansion from vague initial concepts to polished published works. And while there are quite a few books on writing, this one is quite unique in its approach: each of the five chapters represents an island named after an aspect of Taoist philosophy, from Wu-Wei, the Island of Effortless Doing, to Yin-Yang, the Island of Creative Tension. All are packed with effective exercises, inspiring advice, expressive prompts and even breathing techniques. Erica Coetzee, one of Anne’s students, assisted in putting it all together (look out for her wonderfully lyrical writing in the guide! ), and the final result is a treasure to read and to work with, whether you intend exploring this luminous and inviting world of imaginary landscapes on your own or as part of a writers’ circle. I have grown as a creative writer and have become a lot more confident with my creative self. Several of the exercises led me to writing scenes or having new ideas for my current writing project. I managed to do so much writing in just five weeks. There were days when I just went on and on until my fingers felt numb. If you’re planning on a creative excursion, make this book the very first item you pack in your rucksack. Anne Schuster holds an MPhil degree in Language and Literature Education from the University of Cape Town (UCT). She has been facilitating creative writing workshops since 1999 when she started Women’s Writing Workshops, which has grown into a vibrant community of women writers, many of whom are now published authors. She has published collections of writing from Women’s Writing Workshops, including A Woman Sits Down to Write, Women Flashing and Writing the Self. Anne has run courses for the UCT Summer School, the District Six Museum, teachers from Western Cape schools through the Centre for the Book, the Women on Farms Project, the African Gender Institute and the Footprints project with women in Pollsmoor Prison. She has been involved in a life-writing project with women refugees from various countries in Africa and published a collection of their writing in Living on the Fence. Her poetry and short stories are found in a number of collections. She has written two novels. The last, Foolish Delusions, was published in 2005 by Jacana, and was translated into German and published by Kalliope in 2008. Erica Coetzee holds an MA in Philosophy from Stellenbosch University in South Africa. She has worked with many local and international non-governmental organisations, specialising in the development of learning materials. She has researched and written materials on a broad range of topics relating to democracy, human rights, development and social transformation. Her work has taken a variety of formats, from academic and popular books to comics, training manuals, scripts, educational exhibits and e-learning applications. Erica has participated in several creative writing workshops and retreats run by Anne Schuster.